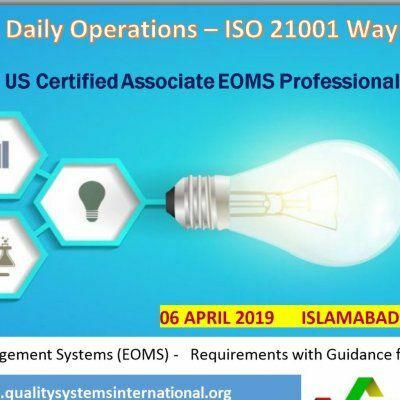 ISO 21001 is an international standard developed by the International Organization for Standardization which provides management tools for organizations that offer educational products and services. It intends to help educational providers meet students requirements and needs. ISO 21001 is based on ISO 9001 QMS, but it provides a specific framework for educational organizations that aim to enhance the satisfaction of their learners by improving the educational processes and ensuring conformity to learners’ requirements. The standard can be applicable to all organizations that provide a curriculum for the development of knowledge, skills and attitudes by means of different lecturing methods. ISO 21001 Certification will enable you to provide educational services in a more effective and efficient manner, and to offer a more personalized experience to all learners, particularly to those with special education needs and distance learners. Moreover, by becoming ISO 21001 certified, you can demonstrate to stakeholders that you are committed towards improving your educational system. Imran Rana is JSQC Japan & ASQ-USA Certified Trainer. Adjunct Faculty University of Tsukuba- Japan, University of the Punjab-Lahore, is member of ISO TC/176. He is Six Sigma Master Black Belt from ASQ-USA and board member of International Accreditation Association USA. IRCA-UK registered Lead Auditor & MBNQA Educational System Assessor from ANSI-USA.